The PA's representative at the UN says the ICC can begin examining Israeli "war crimes" without waiting until the PA becomes a member. The Palestinian Authority’s representative at the United Nations said on Thursday that the prosecutor of the International Criminal Court (ICC) can immediately start examining allegations of war crimes against Israel if she chooses, according to The Associated Press (AP). 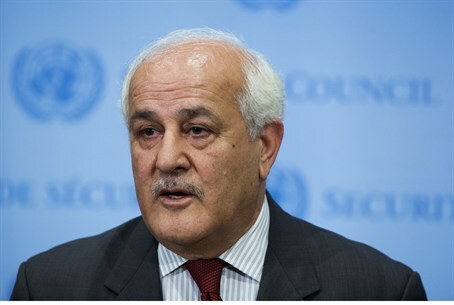 The envoy, Riyad Mansour, told a group of reporters that the PA’s formal acceptance of the court's jurisdiction gives ICC prosecutor Fatou Bensouda a green light to take up the question of alleged war crimes, without waiting for the PA to formally become a member of the court on April 1. "It is within her discretion that she can do that," Mansour said, according to AP. Fadi El Abdallah, a spokesman for the ICC in The Hague, Netherlands, confirmed that the prosecutor can now in theory begin a "preliminary examination" of potential cases in the PA. Bensouda, however, has not announced any such examination yet. On Tuesday, United Nations (UN) Secretary-General Ban Ki-moon announced that the PA will join the ICC on April 1. The announcement came several days after the PA formally presented a request to the United Nations to join the ICC. While the PA could potentially ask the ICC to investigate war crimes by Israel during last summer's Gaza war, Hamas which controls Gaza can be sued for war crimes as well, especially due to its firing of hundreds of rockets into Israeli territory. "Given past practice we would expect the prosecutor to begin a preliminary examination during which she would decide if she will take the next step and open an actual investigation," Richard Dicker, director of international justice at Human Rights Watch, told AP. The ICC stressed on Monday that accepting its jurisdiction "does not automatically trigger an investigation." It said the prosecutor must determine whether the criteria have been met under the Rome Statute, which established the court. On Monday, legal rights group Shurat Hadin filed three more war crimes charges against the Palestine Liberation Organization (PLO) in the ICC. The PLO already faces criminal charges being levied against it in the U.S. court system for terror attacks it committed during the early 2000s. Despite the PA’s threats to sue Israel at the court, in a recent interview, the PA's envoy to the United Nations Human Rights Council (UNHRC) admitted the PA has no hope of pressing charges against Israel in international courts - because Palestinian Arab terrorist groups are far worse violators of international law themselves.